“Only you would know about postage stamps, you throwback.” The tall man ran his fingers through his mop of “dishwater” brown hair. He actually admired Ricky’s talent for “old school,” but didn’t always appreciate it. Picking up the envelope, he still knew enough to realize that no return address was unusual. Brian ripped open the gaily yellow envelope and found a single card inside with the words, “You’re Invited Grartor Party Saturday Next” printed on it. “Forget it, you ignorant white prick.” Ricky really didn’t care what Brian said. He just liked yanking at his latent liberal guilt of a pampered college boy with moneyed parents. Antagonizing each other was a defining characteristic of their friendship. “Do I look like Google to you?” They’d carried on this entire conversation while Ricky was still gaming, a talent they both possessed with their PCs situated so they were back to back when they were playing. “Fine.” Brian went into the kitchen and pulled a beer out of the fridge. Taking a swig, he sat back down at his computer, logged in and tried to Google “grartor” and “grator party.” All he came up with was some obscure reference on Roblox. “Thrilled,” came the dry response from behind him. For once, Ricky didn’t say anything, but Brian heard the frantic “clicky-clack” of keys being rapidly punched. “Busy.” Ricky must have hit a new level at the game and was trying not to die. Russell found himself standing in front a apartment complex on South Grand Avenue between 2nd and 3rd streets at 10:59 p.m. He walked into the very posh lobby and saw a gaunt old man sitting behind the front desk. This was the sort of place his parents rented condos at when they vacationed in Aspen, Cabo, and Aruba. “Uh, thanks.” Brian pocketed the invitation and followed directions. He came to an elevator that looked like it was recently installed. It didn’t match the bank of similar units behind him. There was one button, a down arrow. He pushed it and it illuminated. The usual humming sound came from below as the car rose to his level. It opened and he stepped in. Again, only one button, another down arrow. A girl who looked Mexican-American was running toward him. “Hold it a second.” She couldn’t have been more than twenty or so. Rushing in, she smiled. “Thanks.” Brian saw she had an invitation identical to his clutched in her left hand. “No problem.” He smiled back and pressed the down button. She was cute, maybe five foot four, olive skin, dark brown hair which matched her eyes, wearing jeans, and a black T-shirt with green text saying “The Matrix Has You” on the front, complete with the code. It was bent all out of shape by her large, rounded breasts, which his gaze lingered upon. “Do you know what this is all about?” Her question caught him off guard and he looked up at her face. She shoved her invitation into her jeans pocket just as the doors opened. “A parking garage?” Brian’s mouth dropped open as he looked into the dimly lit expanse. “No cars. It’s totally empty,” the young woman replied. “We’ve been had. Let’s get out of here.” Brian turned and pressed the button again, but this time, it didn’t illuminate and the doors stayed open. Before she could answer, a loud siren screamed at them from the car’s ceiling, deafening them. Reflexively the pair ran out of the elevator and into the darkness. Immediately the alarm shut off and the doors slammed shut. “Push the button,” Brian pleaded. “Alright, what sort of game are you playing?” She had her back pressed against the elevator doors, arms at her side with fists clenched. “Look, I’m just as much in the dark as you are. Here’s my invitation. I got one the same as you.” He produced the card from his back pocket. 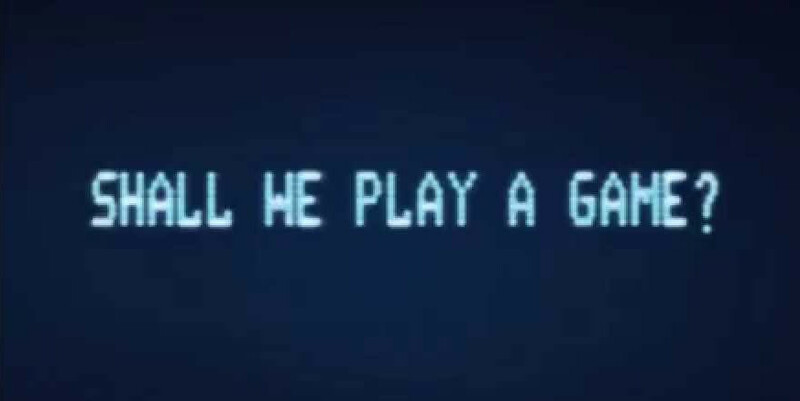 “Shall we play a game?” The voice came from out of the darkness and the distance of the expanse. He sounded playful with a hint of menace. “Essie?” Brian looked at her again. “Why are we here? What do you want?” Brian cried out into the darkness. “We don’t like this game. Let us out.” Essie took Brian’s hand and then let go like it was a snake. “I volunteered…wait. I know you. You did set this up.” Essie edged away from him. “Virtual reality,” she finished his sentence. “Professor Ingram?” Brian squinted into the dim illumination at what he assumed was the far end of the garage. “There were eight of us who went into the VI.” Essie took a step away from the elevator. “I don’t remember what we’re supposed to do next.” Brian put his hand on his head, lowered it, and then looked up. “Where are the others?” He was yelling now, as if the voice might not hear him. “What if we lose?” Essie asked a question dreading the answer. “The game is over and the simulation stops.” Brian had written that part of the program. “We’re not characters. We’re people.” Essie touched Brian’s forearm, but this time kept her hand there, needing the reassurance that he was real. “We’ll die?” Essie began to tremble, and Brian could feel her hand shake. He took her hand and held it. There was a growling off to their left, then the sound of footsteps, or were they paws? A soft metallic sound drew their attention to their feet. They saw ammo belts with holsters containing handguns, and then a pair of assault rifles that weren’t there a second ago. “If you do nothing, they’ll find you and kill you. If you play the game, you’ll have a chance of survival. He grabbed the belt and put it on. By the time he was done, she handed him one of the rifles. Together, Essie and Brian entered the unknown, and the game officially began. I wrote this for Tale Weaver – #183 – Making Sense of Nonsense – Grartor hosted at Mindlovemisery’s Menagerie. 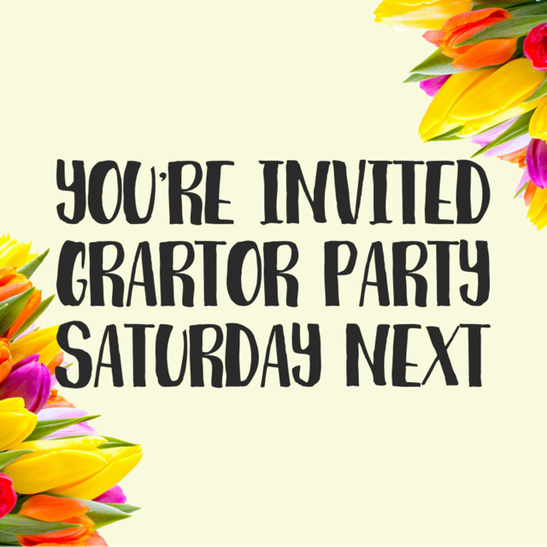 The idea is to use the invitation “”You’re Invited Grartor Party Saturday Next” as the prompt for crafting a poem, short story, or other creative work. There are a couple of links in the body of the story which were my efforts to research “grartor,” which suggested some sort of game. From there, I took elements from a few movies to create the beginning of what obviously is a much larger tale. I hope Brian and Essie make it. Oh, the high-rise apartment building really exists, but I don’t know if it has a mysterious parking garage or not. Did you read Matthew Reilly’s book Contest? I love the links to the films. Very clever. Nope, but I just checked and my local library has a few copies. I thought it an excellent sci fi book. There is no turning back for them. 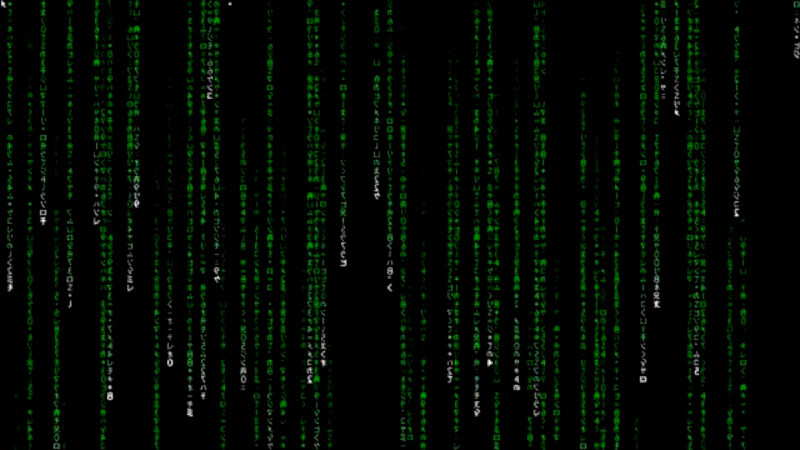 They could have taken the blue pill, then the story would have ended, but they each took the red pill and now they are stuck in Wonderland, falling deeper down the rabbit hole. If they were offered pills, they don’t remember. There are at least three levels to their reality right now. There was a great build up of tension James, well done and we can imagine what happened in the game. I kept thinking it was a great use of the nonsense word and thanks so much for sharing your thoughts. Your nonsense word actually did mean something, though rather obscure. This really is the beginning of a novel. Brian and Essie could live forever in more chapters! NIce spin on your domain name. I actually thought it was powered by bots. LOL. Thanks. Actually, I came up with the name of my blog from the first novel I ever imagined writing (and then abandoned). It was about Asimov “three law” robots who imagined their human creator to be God and then found out he was an observant Jew who had a God. What would happen if you found out your God had a God? It was an interesting question, but in the end, I decided not to rip off Asimov’s concept. Thanks. Tell me more. What about the way I think? Well, I like the way you make a story come together in a logical sequence. That’s not always easy for people to do. I’m hardly a perfect writer, but I try to think of the things that bug me in other people’s stories, such as “how did they get from point A to point B?” I’m pretty much walking through the “scene” with my characters when I write. I remember many decades ago, I was best friends with a guy in high school and college. His Dad taught film classes at UNLV and was a personal friend of Chuck Jones. Yeah, that Chuck Jones, who created Bugs Bunny and the rest of the Warner Bros. cartoon characters. Anyway, he had some original drawings of Jones’ hung up in his house. One was of Jones’ depiction of Kiplings “The Jungle Book.” It showed a wolf trying to carry a baby (Mowgli) in it’s mouth, and my friend’s Dad said that Jones’ explained to him why the wolf had to sort of lean backwards to compensate for the child’s weight. Most other artists wouldn’t have bothered, but Jones understood how to depict reality, even in an animated feature. That’s how we should write in science fiction and fantasy as well. What an interesting story. I will have to keep that in mind. Research counts, for sure!